After researching the best meal replacement shakes, I opted for this bundle and have been hooked ever since!! 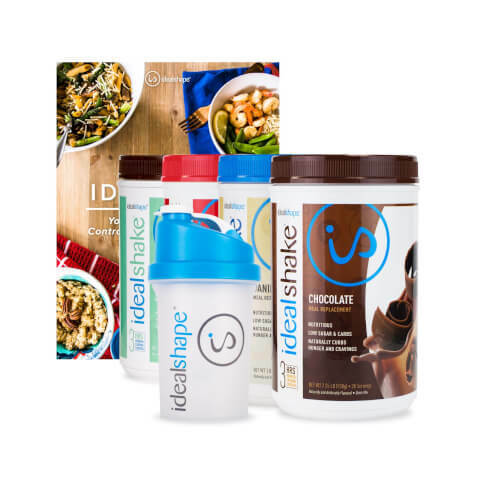 Not only do the shakes taste AMAZING, they really DO stave off hunger, and the shaker bottle is so easy to use, and travels well!! I have become an Idealshake addict :)!!! This is my favorite deal. What a bargain. These shakes do help you stay full! I have tried other brands of meal replacement shakes in the past. You name it, I have tried it. I kept seeing ads on Facebook for Ideal Shake's and decided to give it a try. I used to think about food from the time I woke up until when I went to bed. Now, I can honestly say that is not the case. I have a meal replacement shake in the morning, I add a packet of Ideal Boost too my water mid morning and again late afternoon. I am eating a sensible meal in the evening and snacks during the day. I have started loosing weight again! The Salted Caramel, Vanilla, Cookies and Cream are excellent and I will be ordering them again. The Chocolate Cream Pie was good but just not a favorite.